Enjoy this supercut of cartoons showing Russian President Vladimir Putin taking a creative approach to tackling official corruption in Russia. For the last few months the People's Front for Russia (a coalition of several pro-government organizations) has been publishing short cartoons showing Russian President Vladimir Putin dealing with a series of corrupt officials he has summoned to the Kremlin. In each video Putin listens silently to the desperate explanations of the official in question, after which the Russian leader then liquidates them using various creative different methods, including robots, a disc saw, and a trapdoor under the chair. Russian journalist Alisa Ivanitskaya has now made a supercut of death scenes from these cartoons. 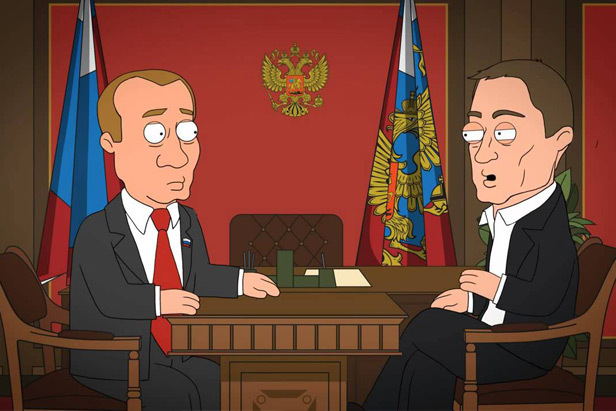 The whole series of cartoons can be watched on the official YouTube People's Front for Russia channel.